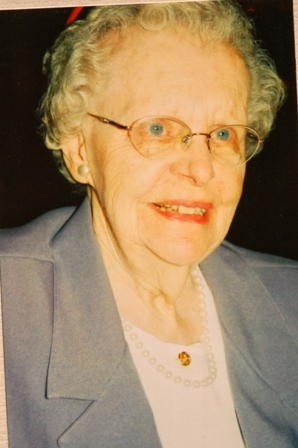 Esther Benz, of Salamanca, New York died Saturday, February 15, 2015 at Heritage Village Healthcare, Gerry, New York where she had lived since 2006. She was born in 1918, the third daughter of Fred and Lillian (Gallin) Benz. After high school in Salamanca she graduated from Wells College. She taught a few years before choosing to go to Columbia University for her graduate degree. She lived at the International House on campus, which was one reason why she chose Columbia. Following Columbia she moved to New Jersey to spend the rest of her professional career teaching in northern NJ. She retired in the 1980’s and returned to Salamanca to make her home. Many remember her dedication to teaching as demonstrated through her coming in early and leaving late, and tutoring students who needed help in order to pass her class. Over the years many of her former students have tracked her down to bring their children to meet her, saying “This is the woman who changed my life.” She did have a number of avocations over the years. Family benefited from her knitting skills, having been outfitted for skiing for years with sweaters, hats and mittens. She dedicated herself to learning decoupage. She was a member of the national association for that craft and won awards at the national conventions for several years. In her retirement she took the volunteer job of curating the showcase at the Salamanca Public Library when this display box was first constructed. She found people with interesting collections. She would write an extensive article about the people, their collections and, when possible, information about the history of the collections. She took great joy in meeting people and finding out about their hobbies. Esther and her sister, Lillian, traveled often. Besides her international travel, (which included trips to Churchill, Manitoba to see polar bears and Machu Picchu) she especially liked long weekend tours filled with the music, drama and art in New York, Toronto, and Washington, D.C. Her ninth decade did not lack for adventures. Always the observer of life and its detail, she started to observe the large number of motorcycles on the road outside her window. Esther decided she wanted to ride a motorcycle for her 90th birthday. With generous assistance and participation from the staff at Heritage Village Healthcare and Harley Davidson of Jamestown, Esther, outfitted in leathers, rode a splendid bike with “a handsome man at the wheel” followed by the Lady Riders and a large number of supporters. The Lady Riders of Harley adopted her as an honorary member and in subsequent years she was part of their annual calendar in the month of September. She was pre-deceased by her sisters Lillian Congdon (1915-2007) and Elizabeth Walker (1917-1995) and her parents. She is survived by two nieces, Martha Congdon (of Pittsfield, MA) and Anita Walker Jessen (of Hingham, MA) and one nephew, Fred Walker (of Centreville VA) as well as 5 grand-nieces and nephews: Matt; Nick; and Elizabeth Walker; and John and Eric Jessen. A celebration of life will be at 3PM Saturday, February 22, 2014. Please meet at the main hall of the Administration Building, Allegany State Park, Red House Area. Burial will be private at Wildwood Cemetery at the convenience of the family. In Lieu of flowers, donations in her memory may be made to the Salamanca Public Library Wildwood Avenue Salamanca, NY 14779 or Allegany State Park, through the Natural Heritage Trust on line at http://nysparks.com/natural-heritage-trust/support-state-parks.aspx . Please direct your memorial to Allegany State Park.